PEPLUM TV: Comic book heroes inspired by action stars? Comic book artists often base the appearance of a character on an actor. John Byrne, during his run on X-men, used Donald Sutherland and Oliver Reed as models for a couple of characters. Paul Gulacy, artist on Marvel's Master of Kung Fu series, based the looks of characters on Sean Connery, Marlon Brando, and Bruce Lee, among others. If a comics artist uses a photograph as reference, it's known as "swiping". Some artists do it a lot. Neal Adams, an artist famous for his very realistic art (and who drew the shot of Kazar on the page you've shown above) often used photo reference. However the artist who drew the pics of Submariner and Silver Surfer is John Buscema, famous for his work on Conan and who drew a couple of the peplum movie adaptations you've shown in the past. Buscema rarely used photo reference as his mastery of anatomy and figure drawing was legendary. Thanks for the info. Swiping is a good term for the practice. 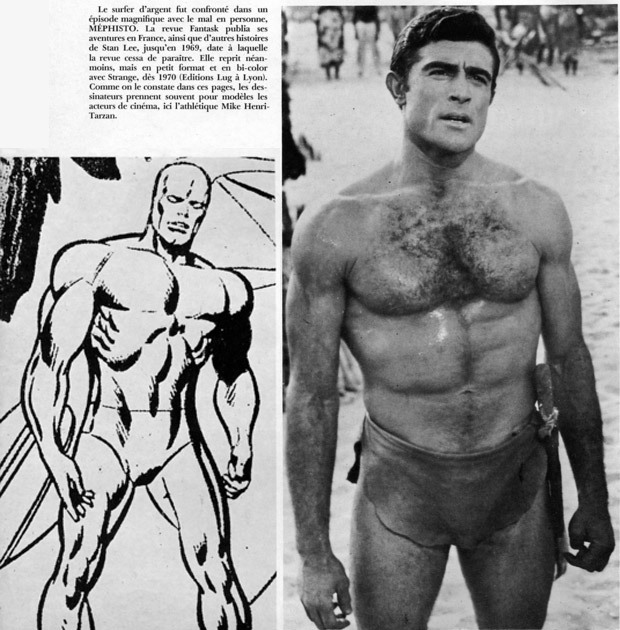 And now a lot of current artists are referring to the art from old comic books which referred to photos of old stars.